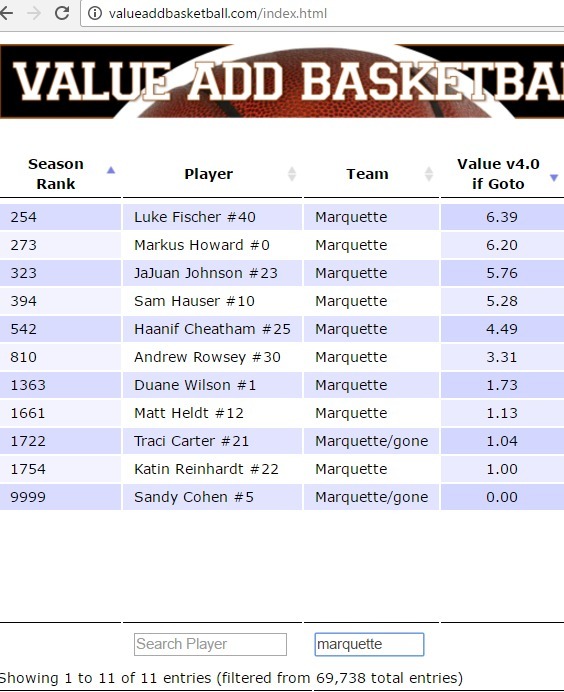 While Markus Howard continues to surge toward the top 5% (top 200) of all players at www.valueaddbasketball.com, the earlier departure of Traci Carter lowers Marquette's team Value Add just enough to classify as the "1st Four Out," the same status MU has with Jerry Palm. Meanwhile, RPI Forecast calculates MU in the "Next Four Out." The basic rule is that if a player has to miss a game it will cost a team his Value Add, however it will be slightly lower if the 9th best player on the team is higher than zero. So if Luke Fischer misses a game, his 6.39 Value Add indicates Marquette is actually about 5.39 points worse off since Katin Reinhardt is in the 9th spot and worth 1.00. This is not due to Reinhardt "replacing" Fischer as it would be in baseball WAR where a backup shortstop replaces a short stop, but rather the "domino" effect outlined in this Big Apples piece on each player becoming a little less efficient as they are stretched to take on more minutes and tougher shots.